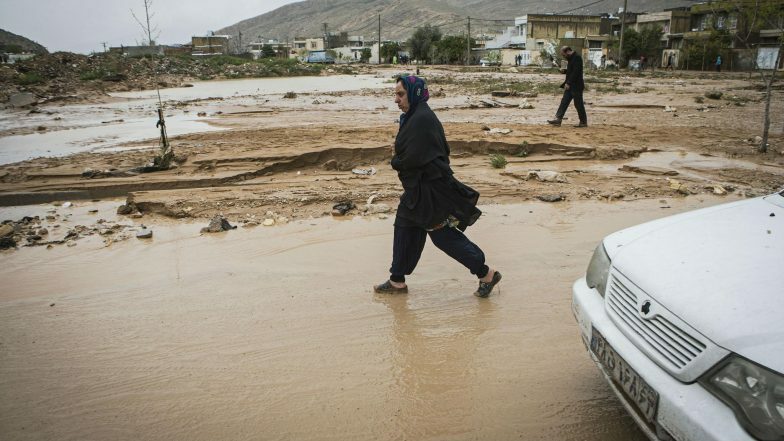 Tehran, April 5: The unprecedented floods across Iran over the past weeks have claimed the lives of at least 70 people, the chief of the Iran Emergency Organization, Pir Hossein Kolivand said on Friday. A total of 791 people have been injured in the floods, Kolivand said. Emergency operation teams have been sent to the cities of Poldokhtar and Mamoulan in Lorestan province which are the worst affected by the floods in western Iran, Kolivand said, Xinhua news agency reported. Iran FM Acuses US of 'economic Terrorism' as Flood-hit Cities Evacuated. Since there is no access by road to the cities due to the level of water and mud, aid is being delivered to the people by air, he said. Medical personnel have reached the sites of the floods to help prevent the spread of contagious diseases, he added. Earlier, Iranian Legal Medicine Organization (ILMO) announced that the provinces of Fars and Lorestan suffered high flood fatalities, with 21 and 14 deaths respectively. Hundreds of people have been relocated as rain and floods forced evacuations. Dozens of villages have disappeared under the mud and sludge in the west of Iran. US Blames Iran for Flood Toll, Says Ready to Help.